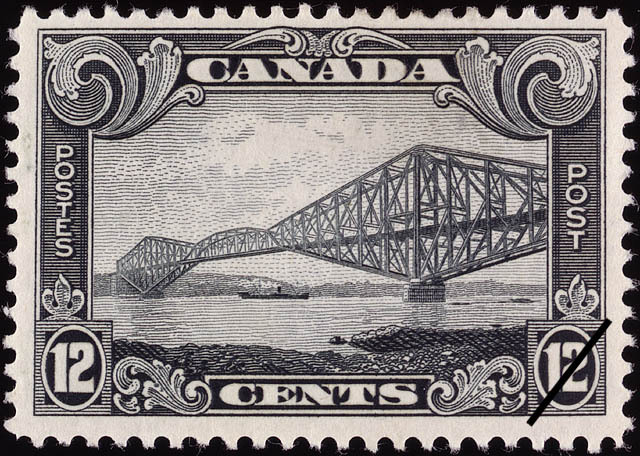 The value of a Québec Bridge - 12 cents 1929 stamp depends on several factors such as quality and wear, supply and demand, rarity, finish and more. Values in the section are based on the market, trends, auctions and recognized books, publications and catalogs. This section also includes information on errors and varieties and characteristics. Commencing with the issue of 1928, the Post Office Department for the first time utilized its higher value stamps with regular issue for the purpose of depicting Canadian scenes of geographical and industrial interest from coast to coast. This was a significant event in the development of Canadian postage stamps as a medium of information about Canada. The first stamps released under this new policy showed wide diversity of subjects. They ranged from the internationally famous fishing schooner Bluenose, on the Atlantic Coast, to scenic Mount Hurd in British Columbia. The scheme met with instant public approval. The Department has continued scenic stamps in each regular issue since 1928. With a few exceptions of commemorative issues prior to 1928, Canadian postage stamps portrayed the royal family. A view of the Quebec Cantilever Bridge engraved from a photograph. One of the major engineering achievements of its kind, it spans the St. Lawrence River near Quebec. After 7 years of construction, it was completed in 1918. It is over half a mile in length, with the main span of 1800 feet. This design was chosen to emphasize achievements in engineering and transportation.